Stuy Town shows us that, once again, they are ahead of the curve when it comes to amenities. In the past few years they've added a cafe, a study, a mini-movie theater, a playroom for the kids as well as a seasonal greenmarket and ice skating rink. Got all that? Good! Via an EV Grieve Facebook friend, now comes word of a new amenity – cremation services! 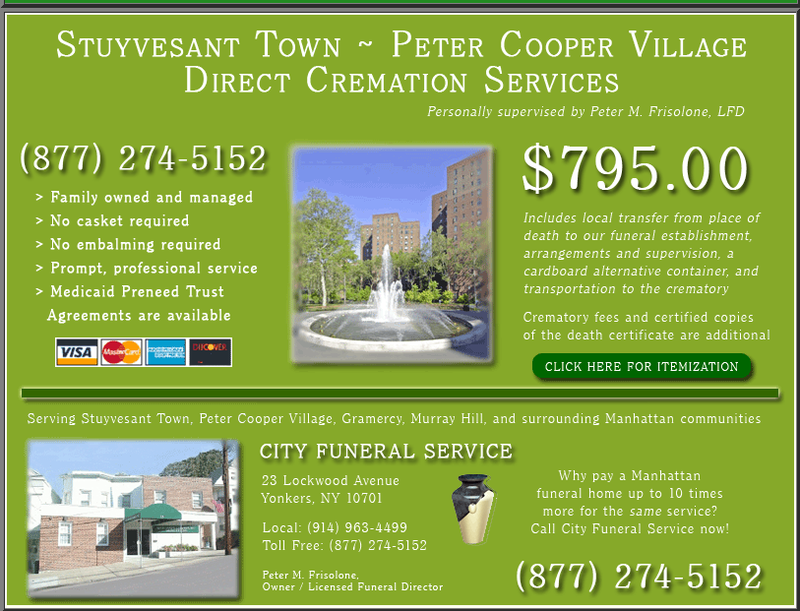 For a mere $795, Stuyvesant Town – Peter Cooper Village Direct Cremation Services will handle all of the morbid details involved with cremating a loved one. And to answer the question of one Facebook commenter, no, they do not take requests. How strict are they about requiring the loved one to be 100% deceased? Just asking. I want my cremains fused into a brick so I can become a part of Stuy Town for eternity. good way to get rid of those low paying tenants. however, it sounds like a bad joke to me. For residents and their guests, right? Hmm. In queens it's only $300. $300 for a cremation? People will be coming in from out of state for that deal! Great headline! You're killing me over here! Can't you could just toss the bodies down the incinerator chute for free? They can't get rid of the rent stabilized tenants quick enough, can they! I'm thinking about starting a punk band called the Cremains. "Gee CW Capital, I'm so excited, I don't know whether to live or die." the faster the cremation, the sooner they can flip apartments out of rent stabilization and into market rates. one of our elderly neighbors recently passed and not a month later, renovations have begun. not that this is unexpected or unfair, but i cringe at who the new tenants will be. another elderly neighbor and long-time stuytown resident told us that management used to haul the deceased out upright in black body bags, down the elevator. not sure i'd go for that ride!